When Rosa Parks died last year, the whole world re-heard the story of the woman who sparked the US "Civil Rights" movement. This is the version most people know. A poor tired black seamstress took a seat in the front of a Montgomery, Alabama bus on December 1, 1955. The driver asked her to move to the back under the state's Segregation law. Parks refused and was then arrested. A few days later Martin Luther King arrived in town to launch the Montgomery Bus Boycott. After 381 days, the Supreme Court ordered the city buses integrated. This victory set in train a series of protests, marches, strikes, boycotts and civil disobedience that destroyed Southern racial segregation and the "Jim Crow" laws which had oppressed black communities. Like the destruction of Apartheid in South Africa, the changes were long overdue and entirely just. However there was a little more to the story of heroic Rosa Parks. Our society teaches history through stories of remarkable individuals, and while Rosa Parks was indeed remarkable, her story is also about collective action, willed risk, intentional plans and mass movement. Sanitized versions of this story refer to Mrs. Parks as simply being tired on December 1, 1955 when she refused to give up her seat to a white man. She was not simply tired that day but tired of racism and segregation, tired of constantly being treated as a second-class citizen. At the time of her arrest, Rosa Parks was a respected community leader already working to counter humiliating racist laws and traditions. She became secretary of the Montgomery National Association for the Advancement of Colored People chapter as early as 1943 and tried to register to vote three times before doing so for the first time in 1945. As a member of the NAACP, she worked on voter registration and youth programs, and in fact on that particular December 1st, she needed to get home to prepare for a youth workshop she was conducting that weekend. Rosa Park's continued legacy is the story of action taken in the face of great risk to effect change. "Standing up by sitting down" had huge implications for her own life and the lives of those around her. She was tremendously respected by others and was resolved to live in dignity. Her action was the match needed to light a fire prepared and ready to spark in Montgomery, Alabama and throughout the south. Highlander is honored by our connection to Mrs. Parks. In July 1955 she came to the original Highlander Folk School located in Monteagle, Tennessee, for a workshop on school desegregation, one of many workshops that Highlander held for civil rights freedom fighters during that time. Rosa Parks and other participants from Montgomery actually left that workshop saying they weren't sure that people in their community would stick together to fight segregation. But when she returned to Highlander in March of 1956, one hundred days into what would become a 381 day boycott, 50,000 people in Montgomery were sticking together, walking rather than riding the bus, launching the next phase of the civil rights movement. According to Wikipaedia and other sources the NAACP had been planning a provocation for some time. Black activists had begun to build a case around the arrest of a 15-year-old girl, Claudette Colvin, a student at Booker T. Washington High School in Montgomery. On March 2, 1955, Colvin was handcuffed, arrested and forcibly removed from a public bus when she refused to give up her seat to a white man. She screamed that her constitutional rights were being violated. At the time, Colvin was active in the NAACP's Youth Council, a group to which Rosa Parks served as Advisor. Unfortunately Colvin was found to be pregnant to an older man. Clearly she was not someone the deeply religious and conservative Southern Blacks would rally around. Rosa Parks remained on the left and worked as an aide to Michigan congressman John Conyers. According to The Nation U.S. Rep. John Conyers, the Detroit Democrat who is the senior member of the House Judiciary Committee, was elected to Congress in 1964, the year the Civil Rights Act was passed. He immediately hired Rosa Parks as a member of his staff. Parks, whose political views mirrored those of the outspoken Conyers, would remain on the congressman's staff until her retirement in 1988. Parks would remain close to Conyers, who recalled the other day that, when Nelson Mandela visited Detroit in 1990, the pair joined the South African leader on stage. Mandela got the crowd to join him in chanting "Rosa Parks!" Conyers said that day with Mandela caused him to recognize a simple truth: "Rosa Parks is worldwide." Conyers is a member of the "Progressive Caucus" and is regarded as one of the US Congress's most radical legislators. 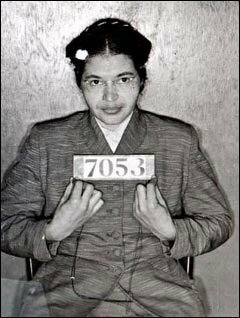 Up to now I thought Rosa Parks had been some old biddy with her knitting acting alone. Just the same, I don't consider you have "exposed" her. So it was planned on a larger scale? A wathershed's a watershed for all that.